Mostly step by step guides on how to achieve something. First of all, you need to login into your LinkedIn account. Quick tip: make sure there is https and not http in the address bar; which means you have a secure connection with the LinkedIn servers. 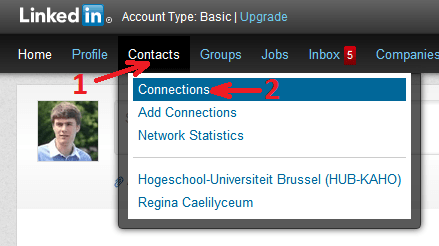 Once logged in, select ‘Contacts’ in the menu on top of the page. Then, click on ‘Connections’. Now you see an overview of all your LinkedIn connections. The next step is easy. On the current page, you will see ‘Remove Connections’ in the top right. If you are having trouble to find it, here is the direct link.